The Minister for Finance has confirmed today that Ireland will seek international help to deal with the economic crisis. THE MINISTER FOR Finance Brian Lenihan has confirmed that Ireland will apply for a bailout from the European Union, the International Monetary Fund and the European Central Bank. Lenihan’s proposal will be made during this afternoon’s Cabinet meeting, he said on RTÉ Radio 1′s This Week programme. He confirmed that the bailout would amount to “tens of billions” of euros, but said that suggestions that it could as much as €70 or €80 billion were inaccurate. Once the state puts in a formal application, official negotiations will begin. The minister said most of the money from the bailout would go towards covering the government deficit, while a “contingency fund” – which would not necessarily be used – would be held for the banks to promote investor confidence. He said that while the interest rate that would be charged for the financial injection was still under discussion, it would be a lot less than the amount Ireland would have to pay on the international markets. During a sometimes heated interview, Lenhihan was asked if the government would call a general election in response to public anger. The minister replied that his focus was on the four-year budget, which is expected to be announced on Tuesday. 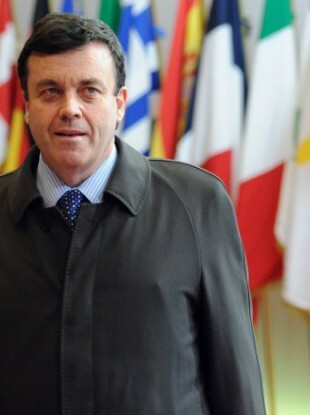 When asked if the government was part of the problem that led to Ireland being forced to seek an international bailout, Lenihan replied: “I do not accept that”. Email “Lenihan confirms Ireland will apply for bailout”. Feedback on “Lenihan confirms Ireland will apply for bailout”.